"One would be hard-pressed to choose a standout performance, but flutist John McMurtery's commanding execution of Density 21.5 is a strong candidate...McMurtery's sensitivity to Varese's formal design and his confidence in the flute's extreme registers made a possibly incomprehensible work intelligible and enjoyable." "...'Carceri d'Invenzione IIb,' a tour de force for flute bristling with invention, was played brilliantly by John McMurtery...[exploring] the extreme high and low registers of the instrument, zapping back and forth at hyperspeed..."
Shea Center for Performing Arts, Wayne. ​UpTown Flutes, the ensemble-in-residence at Drew University, is an all-flute group that has garnered numerous accolades and has become known for its dynamic, topnotch performances. UpTown's appearance at the Shea Center for Performing Arts in William Paterson University's Midday Artist Series was awaited with great anticipation. Due to unforeseen circumstances, however, one of the performers was forced to withdraw from the concert, leaving everyone panicking and wondering: "Would UpTown Flutes perform with only seven players?" The answer was "no." 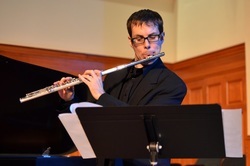 But brave flutist and UpTown member John McMurtery stepped in to perform a solo recital - on one week's notice - in lieu of UpTown's original program. Though commendable on McMurtery's part, this enigmatic attempt to remedy the situation begged yet another question: "Was it really possible for one player to successfully substitute for eight?" After the performance, little doubt was left. The answer was "yes!" McMurtery greeted his audience and spoke briefly about each piece he was to perform, treating listeners with respect as he brought them into his world. It was particularly uplifting to see that the two-dozen middleschoolers in the audience sat transfixed by the performance from first note to last. Henri Dutilleux's [Sonatine] is a delightful piece for flute and piano resting on flowing, watery lines which are occasionally countered by sharp runs up and down the flute registers. The balance between McMurtery and pianist Katherine Palumbo was superb. Palumbo clearly possessed ample knowledge of ensemble performance, supplying solid bass support that was never overpowering. She was also remarkably accommodating during quieter moments, when she exercised an exceptional ear for color and delicacy that allowed the flute's melodic lines to float overhead. Copland's Duo opened with a flute solo that was simply breathtaking; the soulful ballad of a lonely bird. The texture soon grew richer when joined by the piano in a first movement that was aptly entitled, "Flowing," followed by "Poetic, somewhat mournful." The performers appeared completely relaxed and conveyed their themes simply and lyrically as the music swept up to a climax, then again calmed to wallow in melancholic despair. "Lively, with bounce" presented energetic dialogues in which the piano and flute discoursed in sharply articulated textures that conjured images of a jaunty dance. James Romig, a young composer and Music Director of the Society for Chromatic Art in New York City, is a close friend of John McMurtery's. 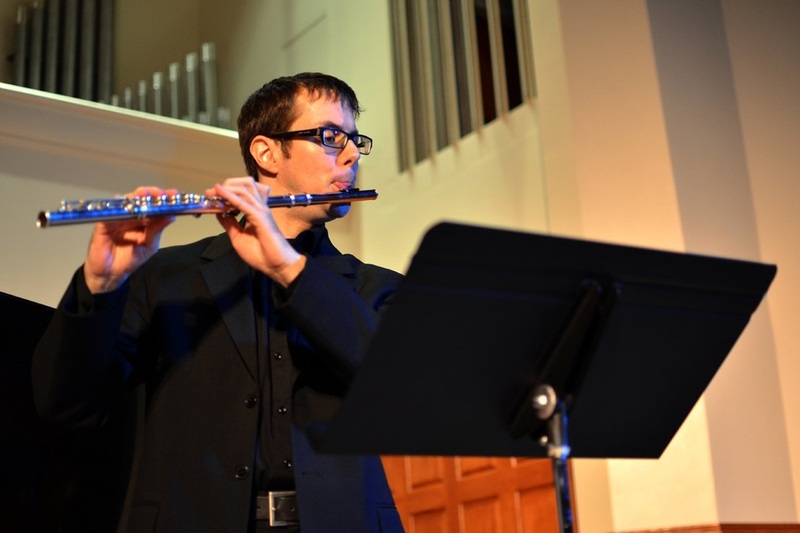 "James showed me sketches of his Sonnet 2 for solo flute," said McMurtery, "and I was very interested from the beginning in performing it on some of my programs. We usually discussed details and ideas for the piece while out on the tennis courts." The work is a fiendishly difficult five minutes and commands the player to zip back and forth up and down the registers, jumping and leaping all over creation, while ornamenting with interspersed running notes, repeated notes and trills. McMurtery declared that he has performed Sonnet 2 over thirty times since its premiere, and it is quite clear why: he is great at it. Romig's work allows him complete freedom to display the wide scope of dynamics and color that defines his musicianship. "Prokofiev's Sonata op. 94 was originally written for flute and piano," McMurtery continued. "It was only later transcribed by the composer for violin and piano. Violinists will sometimes claim that their version was first, trying to steal the thunder from flutists, but it was originally written for flute, and don't let anyone tell you different." With a playful twinkle in his eye, McMurtery smiled at his pianist, cued, and began. The piece as a flute sonata exposes many elements of the score that are amiss in the violin sonata. The opening theme of the "Moderato" can sound gritty and edgy on the violin, casting a nervous mood right from the start. On the flute, however, the first line is simply gorgeous in its simplicity. From the "Allegretto scherzando," through the sweet lullaby of the "Andante" opening theme, arriving at the technical fireworks of the "Allegro con brio," McMurtery and Palumbo gave a great performance, capturing Prokofiev's signature style of wit and finesse. From an audience perspective, McMurtery's appeal as a performer has a great deal to do with his stage presence. He performs as a very confident - but never arrogant - young virtuoso who does not feel the need to prove his worth or make unnecessary gestures simply to draw an audience. Like his beautiful tone, polished technique, and extraordinary control, his confidence is just another tool in the arsenal with which he is able to serve the greater good: the music. A wise performer once posed the question: Do you simply love yourself within the music, or do you love the music as it passes through you? For flutist John McMurtery, the answer is as clear as his crystal sound.